The Ditmar preliminary ballot got released today and, holy freaking hell, I’m on it! The Beast’s Heart has been nominated for Best Novel, A Hand of Knaves has been nominated for Best Collection, and I’ve been nominated for Best New Talent! 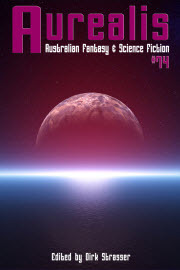 The Ditmars, in case you’re not familiar with them, are Australia’s fan-nominated awards, so I am more than thrilled to find myself on this list. Just to give you an indication of the kind of company I’m in, when I showed my partner the list of other names The Beast’s Heart is up against to take out the gong, he laughed. Any day I find myself on a list with the likes of Sam Hawke for City of Lies, Kaaron Warren for Tide of Stone, Alan Baxter for Devouring Dark, or Amanda Bridgeman for The Subjugate, is a good day. And, not only has A Hand of Knaves been nommed for Best Collected Work, but the obscenely talented Shauna O’Meara has bagged a well-deserved nomination for her exquisite illustrations. It’s immensely satisfying to see so many other good friends receive nominations. It’d probably be just as easy to re-post the entire list rather than list them all individually, but I’m particularly pleased to see the noms for Rivqa Rafael & Tansy Rayner Roberts’ anthology Mother of Invention (including a nom for Best Artwork for it’s stunning cover by Likhain) and for Elizabeth Fitzgerald for Best Fan Publication for her review blog on Earl Grey Editing, especially given she’s just announced she will be winding that up in the near future (sad face). Happily, I have already booked my ticket to Continuum in June (where the awards ceremony will take place). I’m really looking forward to sharing a drink with the others on the ballot and toasting the winners. So thank you from the bottom of my heart for the nominations, and congrats to all my fellow nominees. See you at Continuum in June! Congratulations! I was so pleased to see The Beast’s Heart on the shortlist for Best Novel. And it’s wonderful to see A Hand of Knaves be recognised as well. Continuum is going to be a lot of fun this year! Thank you! 🙂 Continuum is going to be SO MUCH fun!